Concerns about vocal ranges are not to be taken lightly. 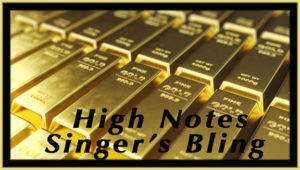 A singer’s high notes are like gold–they’re the singer’s “bling.” But they often come at a cost; a singer can’t simply take them for granted. They must be planned in advance so these notes at the far end of normal vocal ranges can be executed with precision. Here are five tips that will help ensure that both the high and low notes hit the jackpot. Set up the high note with an early consonant. In order to sing the vowel of the word directly on the beat where it belongs, you must sing the consonant before the word, during the space of the previous word. Also, you have to sing the consonant on the very same pitch of the word before the top note. Make the articulation of the consonants very rhythmic. Go a little early to the high notes. Try simply speaking the uppermost note. Often you will encounter what I call a “pop-up” note. This is a short top-of-the-arc high note that returns immediately to a lower register. Most singers tend to make even these short notes a destination. They aim for the high note and sing it way too loud and way too long. This high note is not the destination. You are just passing through it and the less fuss you make of it the better. So why not imagine you are speaking it, instead of singing it? The mind is a powerful force when you sing and, as strange as it sounds, sometimes if you imagine you are speaking, the top note will just pop out easily — and right on pitch. A note about low notes. Don’t forget about the low notes. As you stretch the boundaries of your vocal ranges, you will see that many of the little techniques I use on the upper range notes work equally well on the low notes. It’s especially important to go early to the low notes and equally important to imagine you are singing in your speaking voice. Bonus tip for the highs and lows. When you are at the extremes of your vocal ranges, special tricks come into play even more. Here’s one you can use–but, please, use it sparingly. As you are about to land on a high note, shift your jaw inward, like a like a buck-toothed rabbit. Execute the note(s) and return your jaw to a normal relaxed position. For a low note, try the opposite. As you approach the note, jut your jaw forward slightly, as if to catch the note in a basket as it falls. And, of course, return to normal. But, as always, support is the magic bullet. So dig into those legs and dip even lower as your vocal ranges expand. I would love to know what you think about this article. Please comment below. Like me on Facebook or follow me on Twitter @MyVoiceCoach. Hi June, Let me know how you and your student like this technique. My students love it. This is amazing information & such powerful techniques! My only wish is that we would’ve found Renee a year or two ago. Hi Cindy, I’m glad that you and Cayse found me now. I really enjoyed working with her and look forward to our next session. I always love getting these. I’d like 1 a day. Hi Joe, Thank you so much, I appreciate the compliment. Your a special person on my musical journey. I plan to incorporate the jaw trick on my singing and to other singers I try to help. The mind was so big for me to become a singer so I know how true that tip is also!! Hope to see you soon my friend. The jaw position tip works amazingly well! In for high notes and out for low notes. I’ll definitely be using it in the future. Thanks Renee! Hi Mike, I’m thrilled you tried the jaw technique and found that it works for you. This is very helpful! Do you recommend singing in a speaking voice 100% of the time? Hi Luke, I’m very glad you liked the article. I have learned more from your blog posts than from several in person vocal instructors! Thank you so much Sandi. 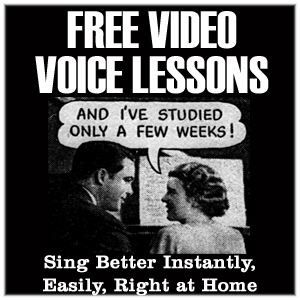 I”m thrilled that my blog is helping you to sing better. Next week’s article will be on breath control.